The Drop Stitch Garter Dishcloth is one of the first patterns I ever took the time to write down, and now it is available as a FREE Ravelry download! Years ago I was asked to teach the drop stitch technique and could find no quick and easy patterns to demonstrate it. Thus was born the Drop Stitch Garter Dishcloth; something we were all already knitting, written down in pattern form for ease of use. It’s a quick knit that is so fun to make you may find yourself with a kitchen-full. 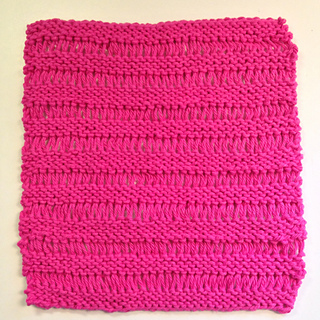 Use cotton yarn for a dishcloth, or substitute something soft and knit it longer to make a lovely scarf. Once you have the technique you can use it in as many ways as you can dream up! by Pisgah Yarn & Dyeing Co.